Tonight we had one of the clearest nights for a long time here in Sydney, and I wasn’t about to let a near full Moon spoil the occasion! So I pulled out my easy to set up 8” dob, and made this quick sketch over the next hour. Since this scope is an f/4, I used my 30 year old RKE eyepiece to give me the best low power image available to me. OH, how I love this eyepiece! Media: China graph & graphite pencils on black paper. 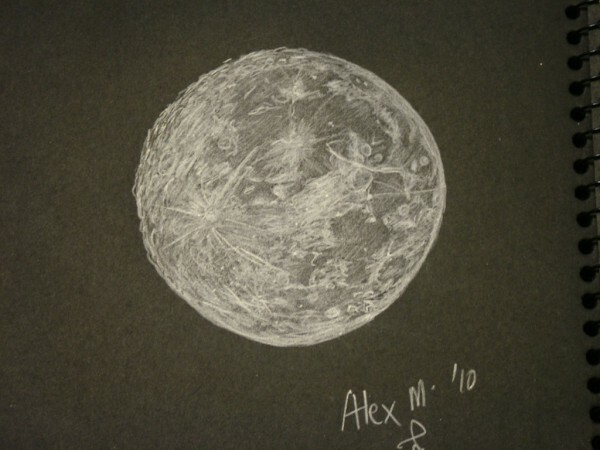 That is a wonderful sketch of a nearly full moon and it includes much fine detail in such a short sketching interval. Sketch looks as good as it did when you showed me it the other day. Amazing sketch! Looks very naturally. Nice piece of work. This sketch continues to surprise me now with a little time between viewing. When I finished I was glad it was over as it was very intense the session. It made that I didn’t ‘see’ the details I thought I had laid down. A few days later, these ‘missing’ details started to reappear. A bit strange, maybe, but now I to am amazed at the finished sketch!